The Tour de France was officially started at Harewood House by HRH William of Cambridge, HRH Catherine of Cambridge and Prince Harry. The three men of the breakaway attacked as the flag dropped. They were Jens Voigt (Trek), Beniot Jerrier (Bretagne) and Nicolas Edet (Cofidis). All three stayed together at the foot of the first climb the Cat. 4, Cote de Cray, Jerrier took the only point at the top of the climb. Jens Voigt took first place at the intermediate sprint and attacked the other two and stayed ahead. Voigt took maximum points on the two Category 3 climbs, the Cote de Buttertubs and the Cote de Grinton Moor. On the former of these climbs, a group including Joaquim Rodriguez and Vuelta winner Chris Horner were dropped and were two minutes behind the peloton at the summit of the final climb. The autobus caught back onto the peloton on the descent past Middleham. The last kilometres were hectic, with a lead out for Cavendish to win looking inevitable. However, out of nowhere Fabian Cancellara attacked and Simon Gerrans and Mark Cavendish crashed with 200m to go. (See Above). 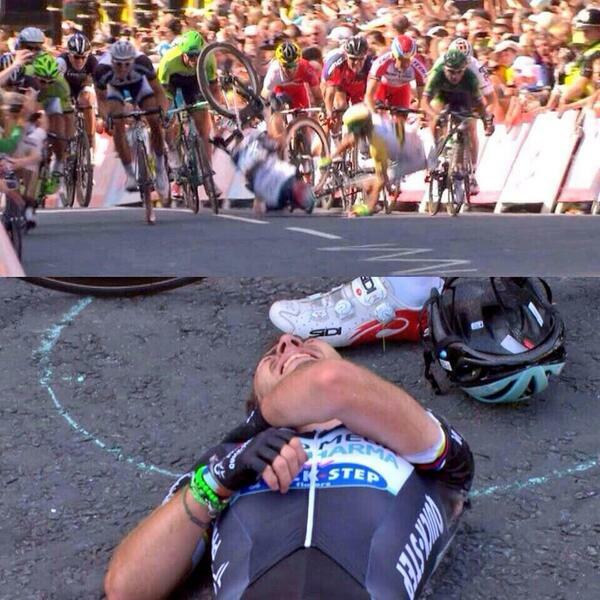 Mark Cavendish came off worse and looks to have broke his collarbone. With Cavendish out, Marcel Kittel forced off Peter Sagan to take the Yellow Jersey.